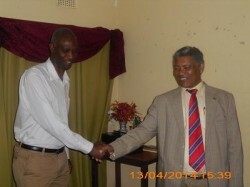 Tuesday the 29th of April, 2014 was another delightful, ecstasy filled, joyful and of course an elating time and moment for Response Network when it was visited by PATRON, Honorable Given Lubinda who is also Kabwata constituency Member of Parliament in Lusaka, and a very much recognized person in Zambia. Though the visit to Response Network may be said to have been a private one, the visit nevertheless brought bliss to the organization and its staff. Despite the honorable M.P having a busy schedule, he however made sure that he had a little chat with staff. The staff and management of Response Network wishes to thank the chairman for his visit to the organization. We appreciate your continued support. Response Network Assistant Country Director Mr Mutukwa Matengenya (L) and Response Board Chairman Hon. Given Lubinda shaking hands after a little chat at the office Board room.